The more things change, the more they stay the same. A tired old saying, but more than applicable when speaking of Times Square. The City of New York spent much of the 1980's alternating between creating grandiose master plans for Time Square and then dithering with developers over the disposition of properties taken over by eminent domain. More often than not these negotiations ended in stalemate, while the buildings in question continued to quietly fester. Meanwhile, the parts of Times Square not on the city's radar were being bought up by other developers who had little patience for the city's vision. Optimistic builders were assembling properties on side streets and areas outside the official development zone. 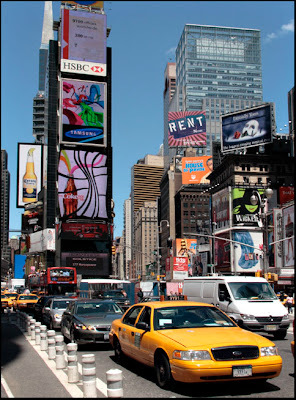 One such is Two Times Square which, despite its name, is just north of Duffy Square. The Sony, Suntory, and Coca-Cola signs were such familiar fixtures that they were left standing while the buildings behind them were razed, then they were attached to the scaffolding of the construction site while the glass tower rose behind them. They were eventually replaced with the current screens and LED monitors we see today. 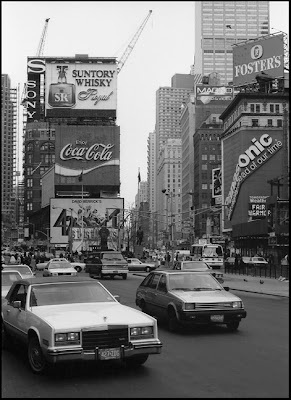 Suntory has disappeared, both from Times Square and, it seems, the American market. (Japanese single-malt whisky?) Samsung replaces Sony, but Coca-Cola still holds the center spot. I remember when I used to like being there in the center of the universe. I always wondered why the Suntory sign was there since it's barely sold in the US. I finally realized that it was for the benefit of Japanese travelers.